The Reynolds Veterans Resource Center was recently recognized by the Virginia Community College System (VCCS) as part of the Commonwealth’s VERITAS program (Veteran Education Resource Initiative for Transition, Advising and Success). Reynolds is one of seven community colleges in Virginia to house a Veterans Resource Center. “These centers are a central hub for all veteran activities on campus. They are a quiet place for students to study; and they enable veterans to connect with each other, helping them renew the bonds of military service,” says VCCS Chancellor Glenn DuBois. Other community colleges included in the VERITAS program are Germanna, John Tyler, Northern Virginia, Thomas Nelson, Tidewater and Virginia Western. Thanks to a new portal created by the VCCS, veterans and military students will now have an easier time earning credit for prior learning. Credits2Careers will allow veterans and service members to upload their Joint Services Transcript to see instantly how their experience can translate into academic credits at more than 1,700 community college programs. The portal also provides real-time employment information and enables users to explore civilian careers related to their area of expertise or interest. Credits2Careers can be accessed at www.credits2careers.org. Virginia’s Community Colleges served 36,868 veterans and military-related students last year. This tool positions the colleges to attract and help even more of these students. To find out more about the Reynolds Veterans Resource Center, visit www.reynolds.edu or call the center at 523-5656. How long have you worked at Reynolds and what are your responsibilities as a Reynolds Police Officer? I've worked at Reynolds Community College since 2000. I originally started in a work study position in the library before accepting a part time position doing audio-visual within the Department of Technology at the Parham Road Campus. Currently, I'm the evening shift supervisor located at the Downtown Campus. My additional responsibilities include teaching the women’s self defense course here and at other colleges, Crisis Intervention Instructor, and working special events with the police department’s DUI simulator. Interacting with students, faculty, and staff. 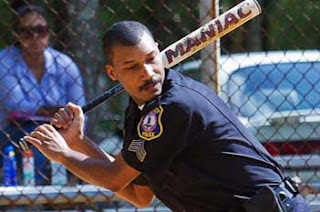 What do you like best about working in law enforcement? Over the years I’ve manage to see a number of individuals that I’ve interacted with that have made mistakes at the college, either come back to finish what they’ve started or pursue other worthy endeavors. It’s always a great feeling to see them striving towards positive goals. What was the best advice you were given when you looked at going into the law enforcement field? A retired New York Police detective told me to stay grounded when dealing with any individual from a murderer to a regular citizen, and remember the motto of Police is to Protect Others Lives In Case Emergency. We know you like to grill and BBQ – what is your favorite thing to grill and give us your favorite grilling tip? Favorite cut of meat to smoke would be brisket. Two favorite tips would be to take your time and enjoy the process - most people don’t take the time to get whatever wood used down to coals. When smoking make sure that the smoke coming from your grill is a thin blue smoke as opposed to white, or gray which could lead to a bitter taste. We heard you like to go on cruises - how many cruises have you been on and what would be your dream cruise? My wife and I have gone on six cruises together. Currently we are waiting for our son to grow up to take him and experience the different states. Any other hobbies other than grilling and cruising? Currently a group of friends and I are preparing to start our youth basketball league. 60 youth between the ages of 13-17, practice and play a season in Henrico County’s east end. We’ve managed this league for 10 plus seasons from December to February. Every child that has played in our league does so free of charge. If you won the $100,000,000 lottery, what would be the first thing you would do with the money? I would invest in three things: my son’s education, my master’s martial arts school, and our youth basketball league. What would be the one superpower you wished you had? I’ve always loved Marvel comics’ characters in my youth, so I would want to have Wolverine’s healing factor. Reynolds Community College’s Chapters of Phi Theta Kappa International Honor Society recently inducted 86 new members recently at their annual fall induction ceremony. Students who have completed 12 transferable credit hours and have a 3.3 cumulative GPA are invited to join PTK every fall and spring semester. Matthew Shapiro delivered a motivational speech as the keynote speaker, emphasizing to the students their responsibility to serve and to lead. Matthew who lives with cerebral palsy, has spent most of his life striving to teach those he has met how to better understand the disability community – he even has his own business: 6 Wheels Consulting. The name references his wheelchair, including its two hidden wheels. 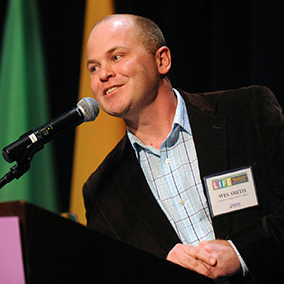 As the CEO of 6 Wheels Consulting, Shapiro works daily to expand his client’s understanding of disabilities, and to give them knowledge they can use in any environment. 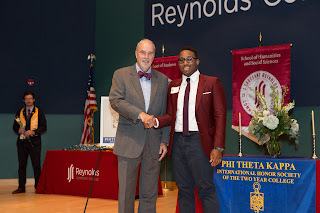 Established in 1918, Phi Theta Kappa Honor Society serves to recognize and encourage the academic achievement of two-year college students and provide opportunities for individual growth and development through honors, leadership and service programming. Reynolds has two chapters at the college. 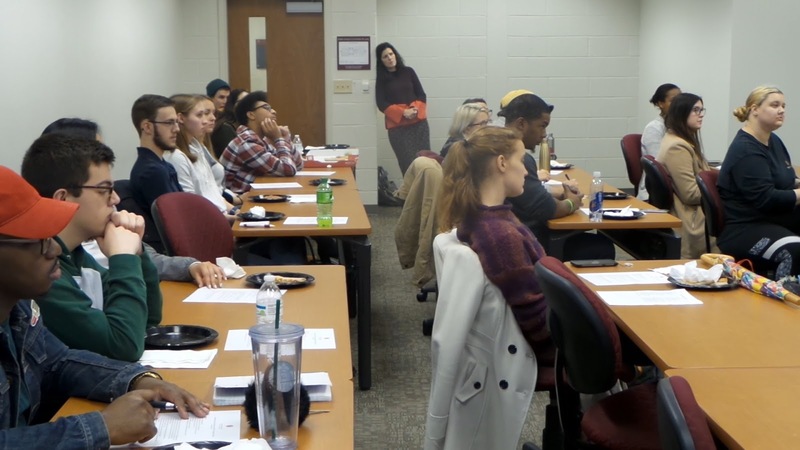 The Alpha Iota Beta chapter represents members enrolled in programs at the Parham Road Campus and the Alpha Gamma Omicron chapter represents members enrolled in programs at the Goochland and Downtown campuses. 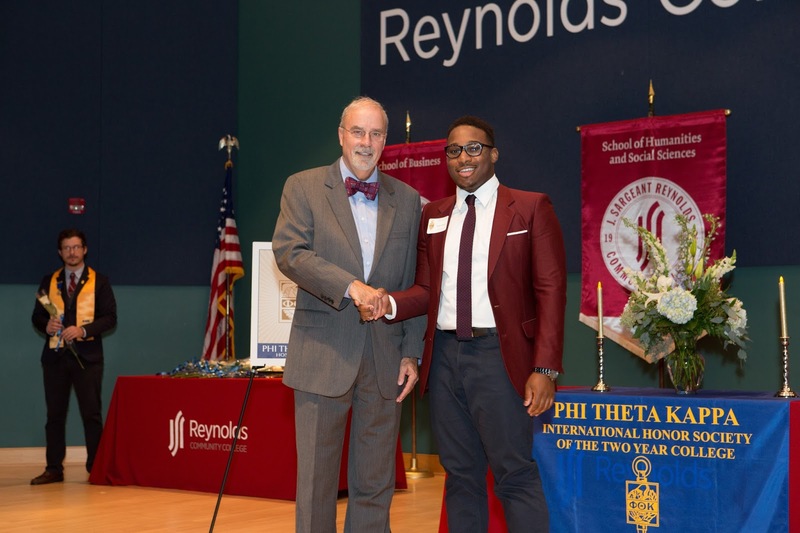 Since 1997 when the Reynolds’ Phi Theta Kappa Alpha Gamma Omicron Chapter was founded, Reynolds has inducted nearly 7,000 students into PTK. The dress code was definitely student-casual, but the attitude was all business. During the hour on Wednesday, November 8 when Reynolds Community College President Dr. Gary Rhodes shared his wisdom and insights about leadership with the current group of Reynolds Honors students there were serious faces, close listening, evidence of processing of deep thoughts, and pizza. What there wasn’t, was cell phones. Reynolds Honors students are serious. They have goals. They have ambitions. They are looking for opportunities to succeed. And, they are mature enough to forego social media to listen and learn. Dr. Rhodes began his talk by pointing out his “uniform”. For the day he was wearing the custodial staff uniform: khaki pants and burgundy shirt with the Reynolds logo. His title, he told the students, is bigger than he is. As a leader, he leads from the front, but he acknowledges all those following his guidance. Dr. Rhodes is not new to talking about leadership. 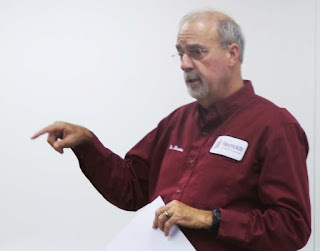 He has presented his list of leadership values and tips statewide in a number of venues. Of utmost importance is, he told the students, is knowing your values. Sometimes that involves asking yourself questions like the one he always asks himself: “Is today’s decision in the best interest of our students?” He asks that question so often he had it embossed on coffee cups and added to a print hanging on the walls of many Reynolds conference rooms. Other values Dr. Rhodes shared with the students were the importance of caring and of doing your very best at whatever you do, of holding yourself accountable, of leading with respect, of making a good first impression, of maintaining a life balance – but, perhaps most important: Dr. Rhodes emphasized finding their passion, and following it. “When you pursue your passion,” he said, “then you’ll get up every day and life will be an exciting adventure.” Great leadership is sure to follow. Before ending with a Q&A session, Dr. Rhodes shared a final story to illustrate the difference between reality and the perception of reality, and how the perception of reality is often more powerful than reality itself. The story was a mix of dilemma, ethics, philosophy, and the how the intention to do right doesn’t always come out as planned. Should the opportunity arise, ask Dr. Rhodes about his baby goose story. The four pillars of the Reynolds Honors program are critical thinking, independent research, interdisciplinary learning, and engagement. From the questions they asked Dr. Rhodes, the students demonstrated these qualities and more. Clearly they are looking for ways to navigate their future, to be great at the lives they are about to begin, and to make a difference in a world that needs their energy and passion. When the session was over the room erupted in twenty different intense conversations, the noise and energy was high and contagious. Fueled by pizza and Dr. Rhodes’ advice, eventually they moved on to face their next classes, their jobs, and whatever other challenges were to come their way that day. How long have you been with CCWA and what are your work responsibilities? It’s been a wild ride. Over the last 7 years, I’ve been CCWA’s Richmond GATE Director, Manufacturing Coordinator, Director of Manufacturing & Logistics Programs, and currently, the Interim Assistant Vice President for Workforce Development. My goal at CCWA is to engage local business and industry partners and job seekers through various workforce solutions and industry credentials. The trades industry is a specific growth sector that I’m currently spending a lot of time on these days. We heard you were in the military – what did you do while serving our country? I joined the Marine Corps directly after high-school. My parents really wanted me to perform a technical job in the military in order to increase my skill-set. I went the opposite direction and enlisted as an infantryman. My unit’s specialty was raiding beaches with zodiac boats. But jokingly, I like to tell people our actual specialty was digging holes and shooting stuff. My personal specialty within our unit was mountain warfare. I became one of the few lead mountain climbers in the division and spent a lot of time hiking and cross-country skiing in California. I also completed two combat tours in Iraq in 2003 and 2004. Iraq was a true blessing for me. It was tough at times, but it changed my outlook on life and made me a truly grateful person. I feel like I gained 15 years of life experience from those 4 years of service. Hanging out with my wife and kids is my favorite. They’re just fun people! Outside of family, it’s all about my side business in real-estate investing and the great outdoors. I try my best to keep the family involved in those areas too. My kids really enjoy the demolition component of rehabbing a house. This may be a slight exaggeration, but I also like to think I’m one of the best smallmouth bass fisherman in Virginia. Build a team/framework that would allow me to become a serial entrepreneur and invest in a ton of real-estate. I’d always be involved in workforce development as well. Nowhere specific, but I am planning to take my family to Costa Rica soon. No resorts or fancy things, just traveling around in a 4-wheel drive rental car to go surfing, fishing, hiking, eating good food, talking to good people, etc. I think we’ll go when my youngest is six. We know you love the outdoors – what would be some of your suggestions for a person who wants to start hiking and camping? Just Do It! I think folks worry about tactics, special gear, expert advice, and preparation too much. Just grab your sneakers, water bottle, beef jerky, and GPS and go play in the mountains. Shenandoah National Park is a good place to start. Where is your favorite place to eat around Richmond? Anywhere I can have a fun date night with my wife and drink a craft beer. What do you like best about working at CCWA? The changing environment. Our workforce is changing at a rapid pace and I believe community colleges are in a position to help drive new innovations within the education and workforce development industry. I’m a huge fan of change and innovation, and CCWA allows me to work in this ever-changing environment on a daily basis. Our team is pretty cool too. Reynolds Community College student Khodr Khalil has been named a 2017 Coca-Cola Leaders of Promise Scholar and will receive a $1,000 scholarship. He is one of 207 Phi Theta Kappa members nationally to earn the distinguished honor. 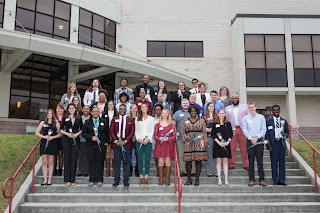 Phi Theta Kappa is the premier honor society recognizing the academic achievement of community college students and helping them to grow as scholars and leaders. The Society is made up of more than 3 million members and nearly 1,300 chapters in nine nations.